RUVIVAL produces e-learning material concerned with sustainable rural development. The project exists since 2016 as part of the Hamburg Open Online University (HOOU). The RUVIVAL Team produces the material at the Institute of Wastewater Management and Water Protection (AWW) as part of the Hamburg University of Technology (TUHH). The aim is to spread knowledge on sustainable practices. This e-learning website gives you the tools to implement sustainable practices in the area of sanitation, water and soil conservation. The RUVIVAL Logo symbolises the reviving of rural areas, especially areas suffering from erosion. Rural areas harbour one of the most vital resources as healthy soil is the foundation for food production and agricultural practices are intertwined with the health of our water bodies. The RUVIVAL material consists of four parts: Toolbox, Lectures, a Serious Game and the developing RUVIVAL community. New materials are added weekly to the Toolbox or Lectures in English, Spanish and starting in 2019 also in German. To keep up to date with new publications you can sign up for our Newsletter. The Toolbox contains knowledge and methods to revive the land, use synergies and develop degraded rural settings. Each entity in the Toolbox consists of a video and a short summary introducing the topic, a literature review for a more in depth insight into the topic, as well as a quiz to test your knowledge on the subject. These publications are a result of collaboration with Master students, PhD students and researchers at the Institute of Wastewater Management and Water Protection at Hamburg University of Technology. They are concerned with restoring degraded areas and creating new, not just inhabitable, but liveable spaces. 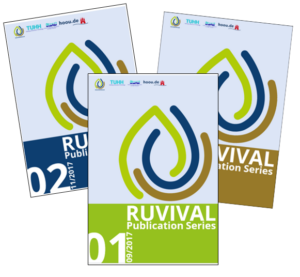 All RUVIVAL publications are available in the readings section for free as a download as we support open access and source. Furthermore, each toolbox contains a variety of other tools like calculators, manuals, handbooks or a database according to the topic. The multimedia lectures are envisioned as a virtual classroom, where students attend the lectures given by guest lecturers. During the lectures, students have the opportunity to test their knowledge in short quizzes. Lectures are usually concerned with broader and more interconnected topics and designed to provide you with comprehensive knowledge on various topics related to rural development and reviving the rural. RUVIVAL also offers a serious game, which takes place once a year for 6-8 weeks. The goal is to plan Eco-Towns in different countries with different conditions in one simulated world. The groups exchange their knowledge, as they experience similar obstacles in the planning process, despite being in a different environment. Everybody can participate in the game and have a role in the development process, however, the core planning groups embedded in the course programme of the TUHH. Since 2017 students in Hamburg, Paris and Toulouse face the challenges to plan Eco-Towns in the simulated world created by the RUVIVAL Team. We hope to enlarge this world in 2019, so if you are interested in participating, please contact us using our contact form. The RUVIVAL community connects people for knowledge exchange and practical experience. You can contribute here to develop the material we publish further by adding context, pictures and ideas. For a glimpse into how RUVIVAL is created, have a look at our Making of RUVIVAL Section. You can also connect with us on Social Media. In case you would like to contact us, please use our Contact Form.